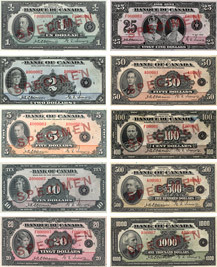 The value of a Bank of Canada banknote depends on several factors such as rarity, wear, mintage, supply and demand, etc. This section will help you to find the value of your Bank of Canada banknotes. Through the various list below, it's also possible to read descriptions of the different series from 1935 to today. 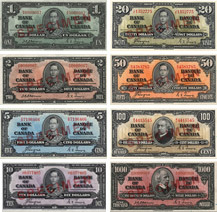 The search is limited to the banknotes from 1935 to 2002. If there is an asterisk "*" on the banknote, add it to to prefix field. Commemorative $10 banknote celebrating the 150th anniversary of Confederation. This banknote was presented at a ceremony held on April 7, 2017 at the headquarters of the Bank in Ottawa and was put into circulation on June 1st of the same year. This commemorative banknote is a variant of the $20 regular polymer one. It was put into circulation in the fall of 2015. The Bank of Canada issued 40 millions of these. 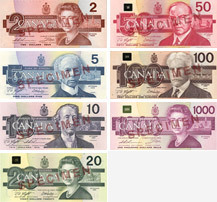 The 1986 series of bank notes, often referred to as the "Birds of Canada" series, was designed with enhanced security features to counter developments in colour-copier technology. In honour of the 100th anniversary of Confederation, a modified version of the 1954 $1 note was issued, bearing the date 1967. 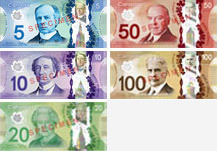 The centennial logo was added to the front of the note and a view of Canada's original Parliament Buildings, destroyed by fire in 1916, was substituted for the prairie landscape that appeared on the original 1954 $1 note. 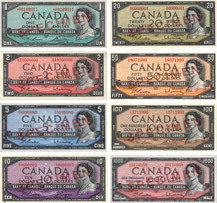 The third series of Bank of Canada bank notes was prepared in 1952. 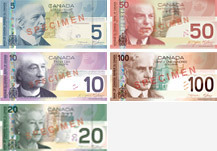 Significant changes to the design of Canada's paper currency gave it a whole new look that set the standard for the future. 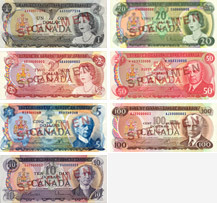 These banknotes were very different from the 1937 series, although the colours and bilingual nature were retained.